The Palos Verdes Student Housing Project will boast 1,304 parking spaces on-site for its residents and visitors. 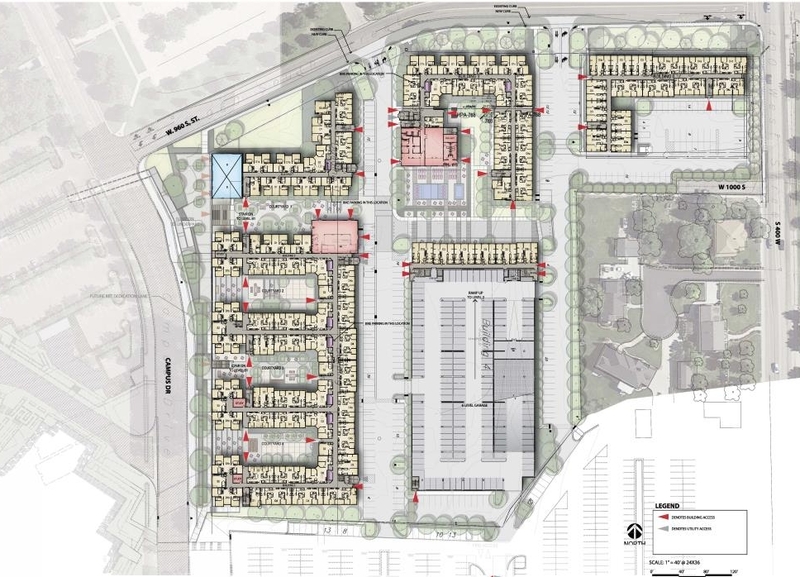 This is more parking than has ever been provided by a student housing project in Utah County. Most student housing projects provide parking spaces for around 50% of their residents - Palos Verdes will be over 80%. Hopefully, given the proximity of the project to campus, residents will leave their cars home. If not, there will be parking. This was an absolute requirement from Orem city. City staff consulted with Provo city to identify lessons learned from their experiences with BYU. The conclusion was the requirement for the project to provide 0.8 parking stalls per resident - a higher parking ratio than has ever been provided by a student housing project in Utah County. This was identified as the only way to assure that residents wouldn't spill over into the adjacent neighborhood. There is such a thing as free parking. Another requirement from Orem city is for resident parking to be provided free of cost. No incentive will exist for residents to park their cars in the adjacent neighborhood - parking will be available on-site.